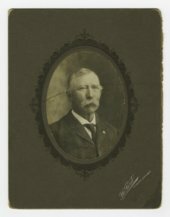 Summary: This is a photograph of Aaron Lane Lanning who was born in Middlesex, New Jersey on November 3, 1845, the son of Ralph and Diana (Bendy) Lanning. Aaron came to Kansas in the summer of 1865 after he was discharged from the Army. He brought his parents and siblings to Mound City, Kansas, and it was here he married Sarah Emma Preston on November 3, 1867. Lanning settled in Melvern where he farmed, served as a township clerk, township trustee, county commissioner superintendent of the Maxon Presbyterian Sunday School, officer on the school board, and post commander of the Grand Army of the Republic. Aaron and Sarah had five children and three of them were living when he died on March 12, 1935.